Zion Market Research has published a new report titled “Fundus Cameras Market by Product Type (Mydriatic Fundus Cameras [Tabletop and Handheld], Non-mydriatic Fundus Cameras [Tabletop and Handheld], Hybrid Fundus Cameras, and ROP Fundus Cameras) and by End User (Hospitals, Ophthalmology Clinics, and Others): Global Industry Perspective, Comprehensive Analysis and Forecast, 2018 - 2024”. 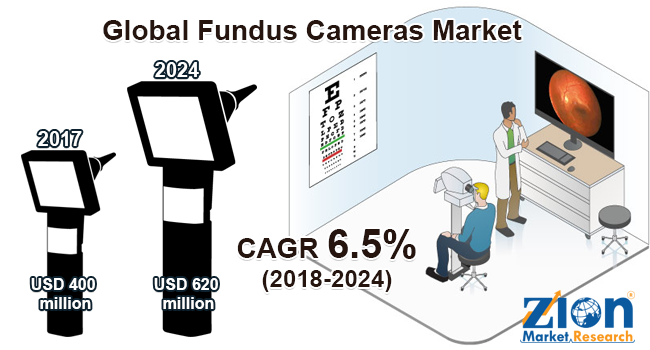 According to the report, global fundus cameras market was valued at approximately USD 400 million in 2017 and is expected to generate revenue of around USD 620 million by end of 2024, growing at a CAGR of around 6.5% between 2018 and 2024. Fundus cameras are used to capture photo or image of an interior surface of the eye. The fundus cameras are built with features such as color variation, angle variation, angiography and red-free images, with easy handling features such as EMR interfacing and DICOM compatibility. The fundus cameras provide digital images of the optic disc, retina, posterior and macula pole, which also enables detail study of image and fast longitudinal tracking and easy image comparison, which helps in an early and accurate identification of eye diseases. The global fundus cameras market is segmented into product type, end user, and by geography. Based on product type, the fundus cameras market is segmented as mydriatic fundus cameras (tabletop and handheld), non-mydriatic fundus cameras (tabletop and handheld), hybrid fundus cameras, and ROP fundus cameras. The non-mydriatic fundus cameras segment accounted for the highest share in the global market in 2017. Non-mydriatic fundus camera allows for imaging of the optic nerve and retina with no pharmacologic dilation, as well as it is painless in nature. Moreover, it provides early detection and monitoring of various serious eye health conditions, such as glaucoma, macular degeneration, injury caused by multiple sclerosis, high blood pressure, and diabetic retinopathy. The camera is easy to operate and provides clear images with a wide angle of the targeted retina. The wide range of benefit provided by non-mydriatic cameras is contributing towards the high share of segment in the global fundus cameras market. Among the tabletop and handheld non-mydriatic fundus cameras, tabletop dominated the global market in 2017 due to the easy availability of product and it provides a better quality image as compared to handheld cameras. On the basis of the end user, the fundus cameras market is segmented into ophthalmology clinics, hospitals, and others. The ophthalmology clinics accounted for the high share in the global fundus cameras market. The high preference of patients for ophthalmology clinics and easy availability of well-equipped clinics are few factors contributing towards the high share of segment in the global market. North America, Europe, Asia Pacific, Latin America, and the Middle East & Africa are key regions covered for the global fundus cameras market. North America dominated the global fundus cameras market in 2017 and is expected to remain dominant over the forthcoming years. Asia Pacific is expected to grow at the highest CAGR over the forecast period in the global fundus cameras market. Some of the key players in fundus cameras market include Canon, Inc., Carl Zeiss Meditec AG, Centervue SpA, Kowa Optimed, Inc., NIDEK Co., Ltd., Optomed Oy (Ltd.), Optovue, Incorporated, Topcon Medical Systems, Inc., and Clarity Medical Systems, Inc. The key players are largely engaged in mergers & acquisitions for development of technically advanced product and to retain their market share and diversify their product portfolio.